Continuing with the theme of “Love” with Tomorrow as valentines day. Although to many of us it may seem like what is the big hoopla all about. In North America, it is a very much commercial day. Restaurants are packed with couples. It was just yesterday my husband and I couldn’t get parking at a local restaurant which has a very large parking lot. I can only imagine how it will be tomorrow night. But this commercialization hasn’t been limited to just targeting adults. The kids in kindergarten are being encouraged to have valentines. Although this may seem cute but it raises the question of are we rushing our children to grow up faster than when we were kids? But that will remain a question for another day. So a lot of times, we are looking for treats for our little ones to enjoy on valentines day. What can be better than cookies? I’m one of those many people who don’t believe in any particular day to celebrate love !!! Yes , I don’t celebrate valentine’s day !! But , when T asked me to write a guest post for her superb blog , I was super excited; the reason , not only being us , me and my husband , to be the great fan of her cooking but also for , this is somehow an opportunity for me to be a part of her blog “Twisted chef T”- one of the very few blogs I love . I’d also like to take a minute to express my love and respect for a great friend , moreover a great personality , Tunazzina . 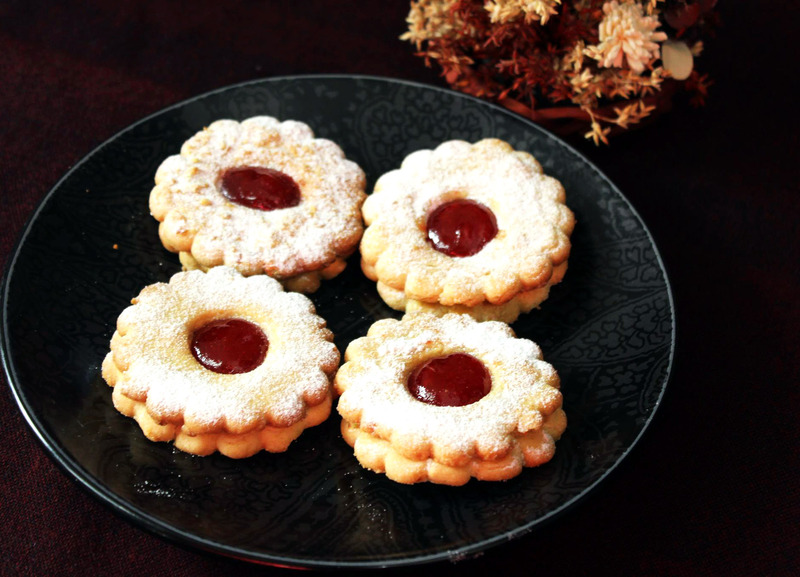 I’m going to share the recipe of Linzer cookies, so much loved by the love of my life – my husband . 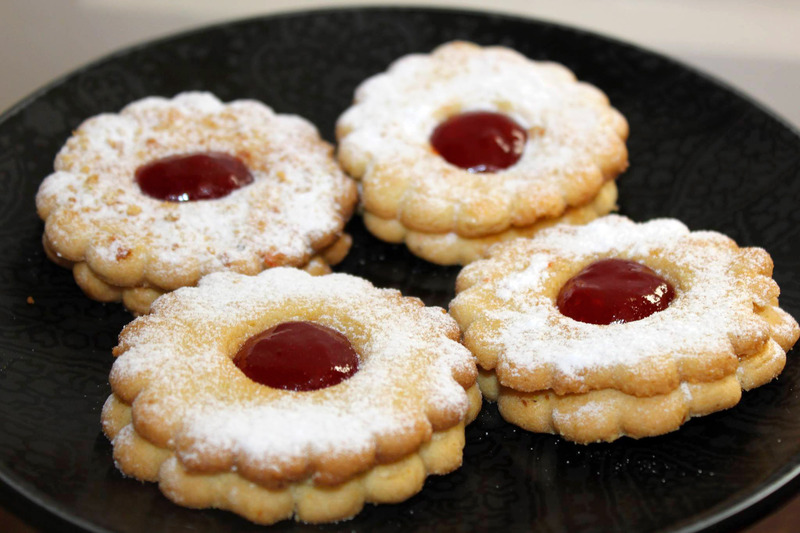 These cute sandwiched cookies with the layer of jam , preferably raspberry jam , originated in Linz – the third largest city of Austria . Traditionally these cookies are almond flavor , as reasonable amount of grounded almond is used in the cookie dough , but I decided to do something twisted for my Twisted Chef T , and that twist being the use of ground pistachio with almond too . So without much talk , let’s proceed to our recipe . 1. Cream the butter and sugar with electric mixer or hand beater until light in color and fluffy . Add in the egg yolk and vanilla . Beat well . Now add the flour and grounded pistachio and almond ,first with a spatula , then with hand mix well until forms a dough . Don’t try to knead them . Gently form it into a shape of ball . 2. Cover the dough with cling film or plastic and refrigerate until firm ( around half n hour). 3. Pre-heat the oven to 350 FH . Now place the dough on a large plastic paper . Cover it with another one . Now gently roll out into a disk , around 1/4 th centimeter. Cut the cookies with cookie cutter . Now take half of the cookies and cut the center of them with a smaller cookie cutter . 4. Brush the cookies with egg white and sprinkle some grounded pistachio over them .Bake the cookies for around 7-8 minutes or until the edges of the cookies are lightly brown . The cookies with the center cut out tend to bake fast . So What I do , I bake the solid cookies with out hole first , then the cookies with the center cut out . Otherwise , some of your cookies might look burnt or over baked . 5. After removing from the oven place them on a wire rack to cool completely . 6. Spread raspberry jam over the middle of the plain side of solid cookies. Don’t go all the way to the edges or the jam will spill from the sides. 7. Using a sifter sprinkle confectioner’s sugar/ powdered sugar on cookies with centers cut out . Now place them over the solid raspberry filled cookies making sandwiches . Add some more jam into the hole. Your gorgeous yet cute Linzer cookies are ready !!!! 1. Once you spread the jam on the cookies , they will tend to be soggy soon . To prevent them , I always preserve them in normal chamber of the fridge in an air tight container . That retains the crispness of the cookies for long . These look delicious, the biscuit looks so nice and delicate! These look delicious. I love linzer tarts! I totally have to make these. I have always liked this type of cookie. Your recipe looks delicious. I love Linzer cookies and these look gorgeous!